Last week I crossed the Shannon into Tipperary and drove to Newport where I met auctioneer James Lee. He took me to see a 94ac upland farm at Rossaguile, about 4km from the north Tipp town. The residential holding is the subject of an executor sale and is guided at around €800,000. In Newport we turned left and climbed towards the farm. The first portion we met was a 19ac piece of elevated ground in two fields that just had a crop of silage taken from it. Driving on another couple of kilometres we arrived at the main farm divided by the road with plenty of road frontage at either side. The majority of the land is located across the road from the house in a parcel of 44.92ac laid out in four big fields with about 1km of road frontage. This has a number of acres planted in young forestry at the lower end. The portion is mainly made up of good grazing ground that needs attention in places. The 28ac of land around the house is bounded by the road and the River Newport. Laid out in five to six fields, the ground needs looking after. It is a combination of permanent pasture and some rougher grazing. The house is a solid, two-storey farmhouse set in an old farm courtyard typical of traditional farmsteads. On the ground floor the accommodation includes a sitting room/kitchen, a parlour, a space that could be used as a bedroom or a playroom and a bathroom. Upstairs are three bedrooms. The courtyard of old farm buildings to the front of the house has a series of lovely old sheds and byres in various states of repair. Some lovely arched stonework decorates some of the structures and, in its day, it would have been a yard one would associate with the bigger farms. The property will be sold at auction tomorrow (Wednesday, July 18) at 3pm. 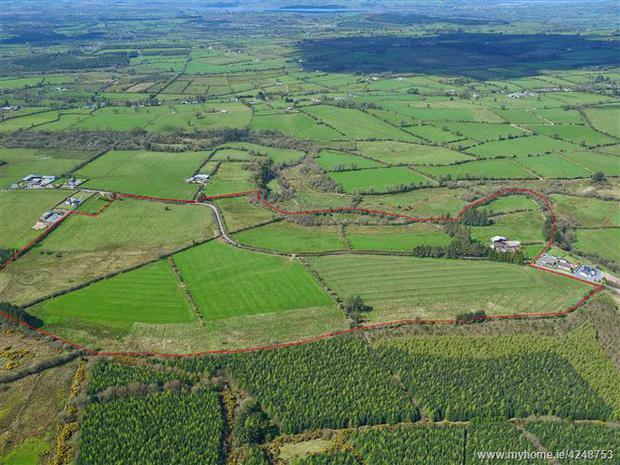 A top class residential farm set on 140 acres of land has hit the market in Wexford.